Laura Davies of Welsh organisation Chwarae Teg (Fair Play) explains the importance of their work with schools to promote gender equality in the classroom. Did you have a moment of surprise? And did you feel a little foolish afterwards? Ask outright if surgeons can be men or women, and the majority of us will likely agree that a surgeon can be either. As part of the Core Workshop that Chwarae Teg delivers to schools within our Fair Foundations programme, I often use the above example as a warm-up because it is a great way of highlighting unconscious stereotypes. Drawing attention to our unconscious prejudices (through subtle examples like the above) helps raise awareness that more positive action is needed if we are to challenge the misconceptions that children may be absorbing from the world around them on a daily basis. It really gets participants thinking about where this exists in their own settings, and how they can positively address it. Since I started working with Chwarae Teg, I have become increasingly aware of how deeply embedded gendered stereotypes can be. They are so much part of our everyday that many of us don’t realise that they even exist until the evidence is hard to ignore (and I have certainly been guilty of this myself!). Gendered stereotypes are frequently perpetuated in marketing (both to children and adults), and can be seen in many of the examples shown in recent Let Toys Be Toys blogs, as well as summarised by the two word clouds below. These examples show frequently used words in adverts for toys targeted at girls and boys respectively, and make marketing bias plain to see. Chwarae Teg works with educators to ensure that all boys and girls are able to reach their potential. Research has identified that the years marked by the Foundation Phase are central to the construction of a child’s gender identity. Our recent research report Gendered Horizons provides further evidence that what children perceive as the ‘norm’ in early years has a significant impact on their choices later in life, including academic studies and career aspirations. Fundamentally, if we continue to gender-mark objects and interests, we are limiting the potential of all children. Part of our Education strand is the delivery of Fair Foundations, a programme for primary and infant schools which aims to raise gender awareness in early years settings by providing free training, support and consultancy to staff across a school. Through our tailored approach working directly with educators, we are able to address the often subtle (and therefore more challenging) stereotypes that can permeate a child’s life and create positive change to directly address these limiting gendered horizons. As part of our work with schools, we frequently refer to the great work of Let Toys Be Toys. We’ve seen for ourselves how children’s view of toys relates to their views on gender, and children as young as 3 years make clear links between interests and gender suitability (for example a photo of a football shown to a Foundation Phase class is overwhelmingly seen as a ‘boys toy’ and a photo of a baby doll as a ‘girls toy’, with many other less stereotypical examples giving a similar outcome). We have heard comments from primary aged children such as ‘they have aisles for boys and girls so boys don’t get the wrong things’ and ‘boys shouldn’t play with dolls’, and we are aware of the impact that media, society, family and peer influence can have on a child’s perception of what is ‘appropriate’ for a particular gender. ‘Men are doctors, women are nurses’. 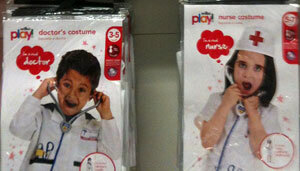 With female doctors set to outnumber male by 2017, where do children get that idea? This leads to interesting assumptions when in a related activity children are asked whether certain careers are ‘for men’, ‘for women’, or ‘for both’. The majority of young children we work with will classify jobs like ‘scientist’ and ‘explorer’ as for men only, and ‘nurse’ and ‘teacher’ as for women only, and it is only through subsequent discussion that we are able to broaden the outcomes so that jobs are seen as accessible to all the children, irrespective of gender. When working directly with education staff, we also hear fascinating insights into children’s own gendering of spaces, despite the efforts of some educators to consciously remove this barrier to learning. When speaking to a Head teacher recently, he raised his concern that boys had begun to dominate the playground space, with girls in small groups often seen to be wandering around the periphery of the main space. Further, since hearing of our programme, he had taken care to observe possible gendered behaviour in his school and had identified the lining up of classes by gender. It had occurred to him that this was further perpetuating the gender split and magnifying associated gendered behaviours. We have worked with schools that have recognised their boys dominating the use of IT, and some who have found their children negatively remarking on boys who express ‘feminine’ traits or interests. In a recent Foundation Phase setting I also saw the book case arranged according to ‘boys’ books’ and ‘girls’ books’. Though this was done with the positive intention to encourage more boys to read (by providing more ‘boys’ topics), it actually reinforced that particular interests are ‘for boys’ and others ‘for girls’, thus potentially putting off half of the class. Outside of our direct work, we frequently hear of other examples – a friend recently noticed that her daughter’s science homework, to write a biography of a famous scientist, included a prompt sheet with questions which all made reference to what ‘he’ might do. The teacher had not intended to refer to a particular gender, but had simply not noticed that the assumption was there. What we recognise in our work is that every school and every cohort is different, but that gender stereotyping can exist in ways that impact on all areas of a child’s education. Of course, playing with gender stereotypes is a normal part of a child’s development and educators are battling a much wider sphere of influence than just their own setting, but it is our hope that by providing them with the appropriate tools to subtly challenge stereotypes and embedding this throughout the curriculum (so that it does not simply become a ‘bolt-on’ subject) we can give children a better chance of combating any potentially restrictive influences. See the new Let Toys Be Toys schools pages for resources on gender in education, including ten ways to challenge gender stereotypes in the classroom. Chwarae Teg began over 20 years ago to support the economic development of women in Wales. Today, our vision is for “A Wales where women achieve and propser”, and we aim to achieve this by delivering our three missions: Working with women to broaden horizons and build confidence; Working with employers to create modern workplaces that are successful by harnessing everyone’s contribution and; Working with influencers, educators and decision makers to build a society that values, supports and benefits women and men equally. For more information about Chwarae Teg‘s Fair Foundations programme please contact Emma Richards, Jess Morgan or Sian Richings, or follow @ChwaraeTegEd on Twitter.